Who are YOU, dear reader? Many Western hotels have a Bible in every room. I never quite understood why that was the case, so today I looked it up. Apparently the Bibles in hotel rooms are the work of an American society called ‘Gideons International’. Their main objective is to provide Bibles free of charge. They are best known for placing Bibles in hotel rooms, but they also distribute Bibles to hospitals and jails. 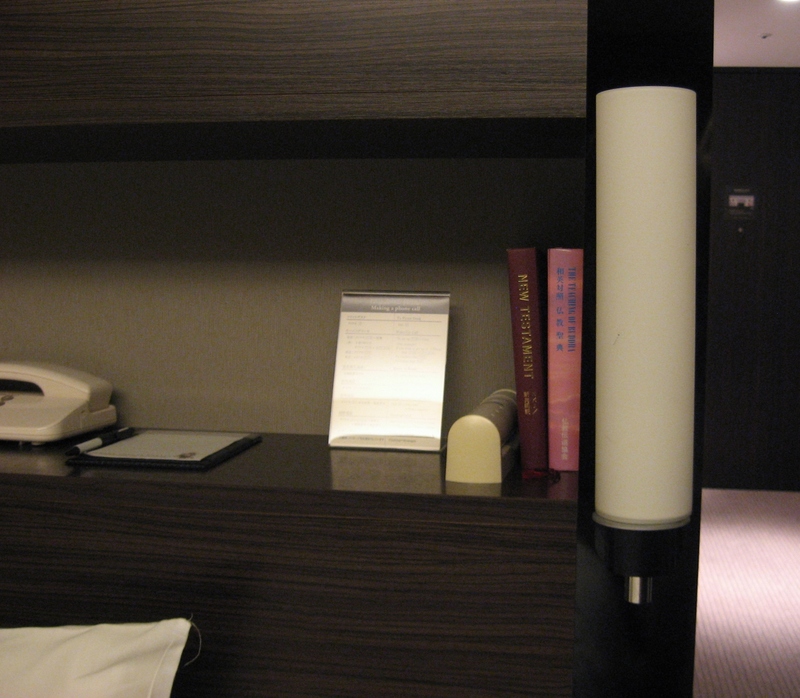 When I was in Japan, I noticed something interesting in our hotel room: it held not one but two religious books. Our Western style room contained a Bible (The New Testament to be exact) and a copy of The Teaching of Buddha. 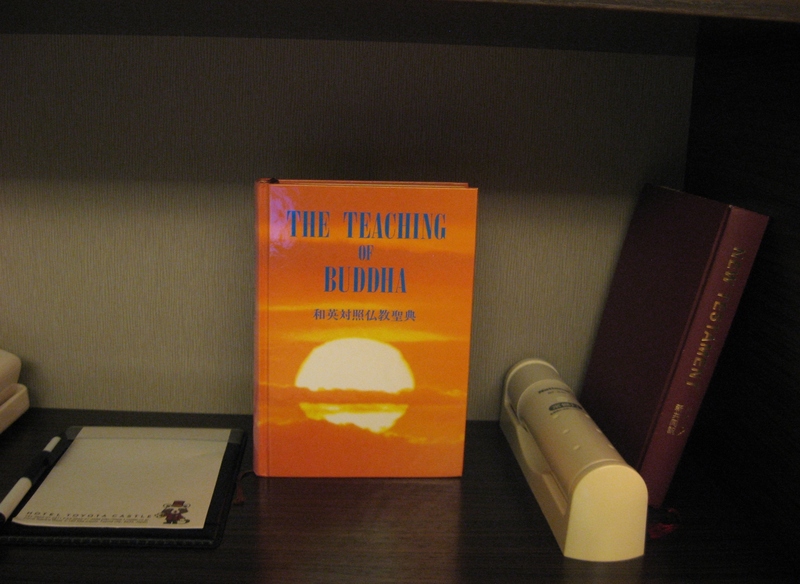 The New Testament and The Teaching of Buddha side by side in our Japanese hotel room. Also notice the emergency flash light next to the books, in case of an earthquake. I have no idea if The Gideons are responsible for the Bible in the room. Do they operate outside of the US as well? Or is The New Testament just an attempt of the hotel to emulate an American style and make foreign guests feel welcome? It seems odd that a country where less than 1% of the population is Christian would offer a Bible in hotel rooms. But then again, our hotel was clearly oriented towards foreigners. I also wonder who placed The Teaching of Buddha in the room. Surely that can’t be the work of The Gideons. Is there a similar society for spreading the word of Buddha? Or is it just an initiative of the hotel business in Japan to make Japanese guests feel equally welcome? In any case it felt really typical of Japan that they would offer multiple options, thus attempting to please all guests and to avoid any possible offence. It also felt a bit exotic to see The Teaching of Buddha in our Western style room. It’s little differences like these that make life in Japan so fascinating to me! I later found out that The Teaching of Buddha is provided by The Society for the Promotion of Buddhism (Bukkyo Dendo Kyokai). The Society is Japanese in origin and was founded by Mr. Numata in 1965. Meanwhile it has offices all over the world. They compiled the book The Teaching of Buddha and have distributed over 8 million copies to hotels in over 50 countries. You can order a free copy of The Teaching of Buddha from your nearest local branch. Two years ago, on March 11 2011, a massive earthquake and ensuing tsunami destroyed the Tōhoku region in northern Japan. Although two years have passed, the tragedy is still very much alive in Japan. Rebuilding the region, and more importantly, people’s lives, will take many more years. In memory of that fateful day, I would like to introduce you to the song ひとつ (‘hitotsu’, or in English ‘one’) by Japanese artist Tsuyoshi Nagabuchi. He wrote this song in 2011 to express his feelings about the disaster. I think many people all over the world will be able to relate to this song, since it talks about living with sadness and losing a loved one. I couldn’t find an English translation of the lyrics, so I had a go at it myself. I have to warn everyone: my Japanese is not that good. I apologize in advance for any mistakes I may have made. If you find a mistake, please post it in the comments section and I will correct it. It’s over a year ago since the big earthquake and the ensuing tsunami took place in Japan. But even now I regularly keep seeing ‘Ganbarou Nippon’ flags en logo’s everywhere. 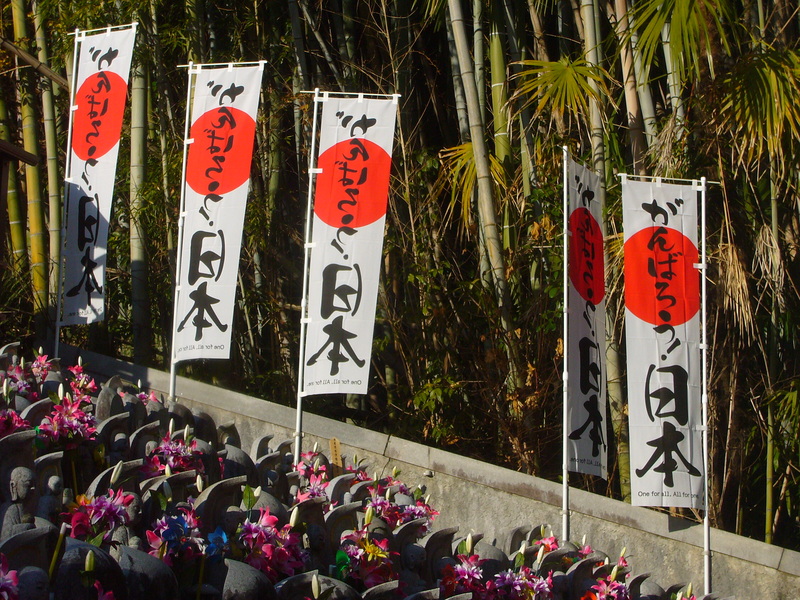 ‘Ganbarou Nippon’ (がんばろう日本) means ‘Do your best, Japan’ or ‘Let’s go, Japan’. 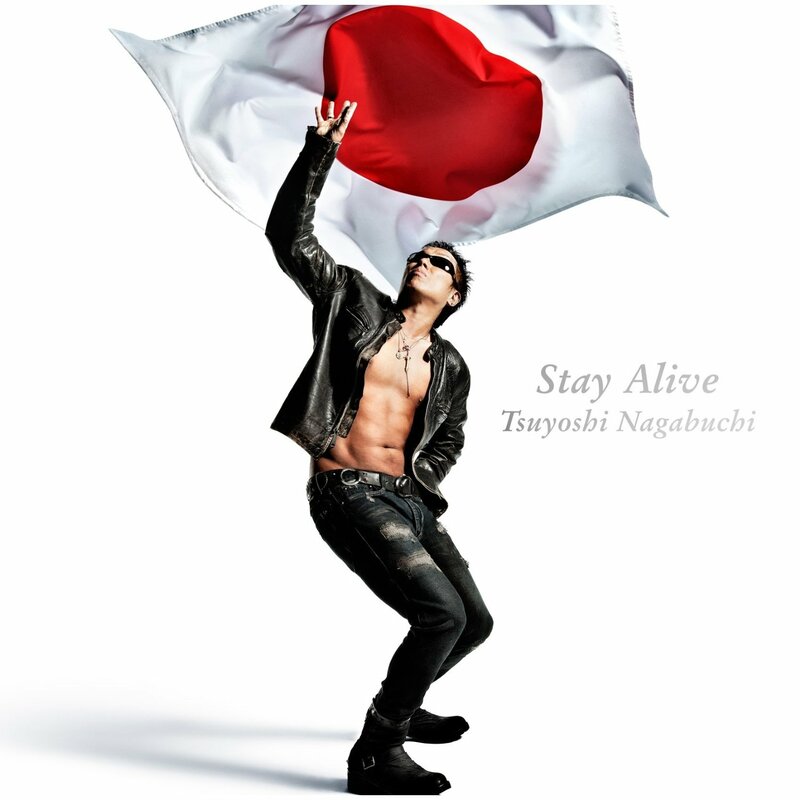 Following the March 11th quake and tsunami, the ‘ganbarou nippon’ campaign was launched. Abroad it is more commonly known as ‘Pray for Japan’. I’m not entirely sure on the details but I imagine the campaign was meant to encourage the victims of the disaster and to rally the rest of the nation to donate and volunteer where they could. 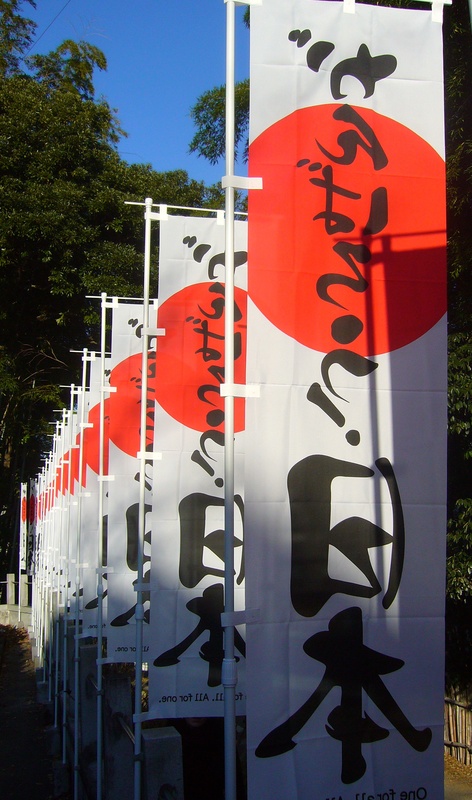 Now, one year later, the Japan National Tourism Organization has started a ‘Japan. Thank you.’ campaign. 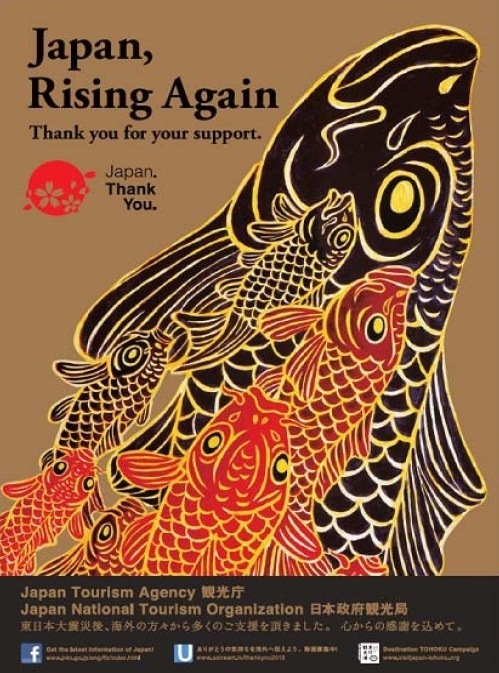 It consists of posters and banners ‘aimed at thanking overseas organizations for their support after the March 11th disaster. It also means to thank tourists who visited Japan and contributed to its economic health following the disaster.’ (Quoting Japan Today). I came across one of the ‘thank you’ posters in Nagoya Castle. I was elated to recognize artwork by Kimura Hideki, a Japanese artist that I had discovered recently and was proudly considering ‘my secret find’. But maybe he is more famous than I realized. Kimura Hideki is based in Gion, the geisha area of Kyoto. 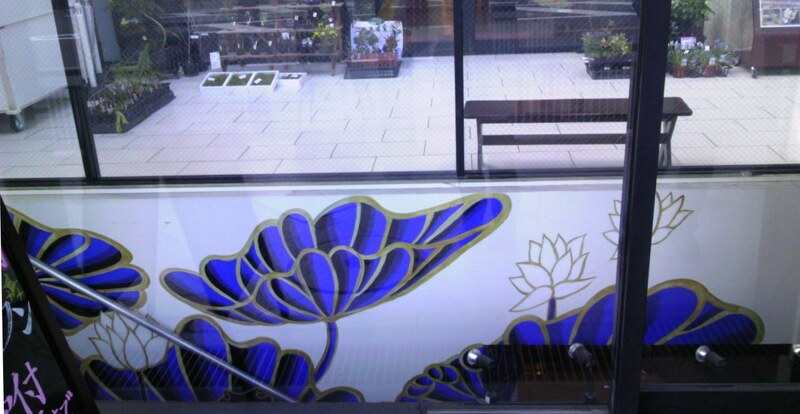 He has a shop with textiles, paintings and other items, and he paints murals all over Kyoto. His artwork is a mix of Asian and Western design. I love his graphic style! Kimura Hideki shop in Kyoto. Picture taken from his website (click on the picture to go to his website). Mural by Kimura Hideki in Kyoto. If you go to his shop in Kyoto, you can get a map with the locations of the murals. In response to the post about ‘my first earthquake‘, many of the readers recounted their experience during the March 11th earthquake (read the comments on the post). Actually I was already planning on posting about that quake at some point, so now is as good a time as any. In Japan this quake is commonly referred to as the Tōhoku quake. As undoubtedly all of you know, it occurred on March 11th 2011 somewhere off the coast of Japan. It had a magnitude of 9 on the Richter scale and is the most powerful earthquake to have ever hit Japan (according to Wikipedia). The main damage was however not caused by the quake itself but by the tsunami that followed in its wake. The first few weeks after the quake, every news station in the world was on top of the story. But since then many foreign media, or in any case Belgian media, have ceased to report on the quake and it’s aftermath. I had the impression that because of this, the general public is also forgetting about the disaster that hit Japan. It was therefore touching to see that in the comments on ‘my first earthquake‘ , people’s thoughts and prayers go out to the people of Japan. Of course the people of Japan are still living with the effects of this disaster every day. The Japanese news brings stories about the disaster every few days and the weather report has a special section for ‘the disaster-affected-area’. The rebuilding is going on as we speak and it will take at least several years for Japan to recover from this disaster. When I first arrived in Japan, I was very impressed with the way Japanese people, including those outside the affected area, still hold the disaster in mind every day. When I talked to people about it, they became very solemn and spoke with great sorrow and compassion about what had happened. Japanese people have a quiet kind of bravery: everyone does what they can, even in places far away from the Tōhoku region (like not turning on the AC to save electricity). People try to stay positive without denying the reality of their situation. Is this a typical Japanese quality, perhaps for cultural and historical reasons? To face your situation wholeheartedly and accept it with all the good and bad that in encompasses? I hope I can find out as I get to know Japan and it’s people better. Last night I experienced an earthquake for the first time. It was a small one, only 2 on the Shindo scale. ‘The what-scale’ you say? Don’t I mean Richter scale? After some research I found out that the Richter scale measures the energy released at the focus of the earthquake. The Shindo scale measures the intensity of shaking at any given location affected by the quake. For the geologists among you – I know there is at least one – the Shindo scale is similar to the Mercalli scale. So, having put that straight, back to the story about the earthquake. As I said it was a small one but it was still impressive. I had heard descriptions of what an earthquake feels like but despite that, it was different from what I had imagined. How did it feel? For this I will have to refer back to those same descriptions for lack of better words: it felt like a gentle swinging from left to right, but not in a pleasant way. Or perhaps it felt like being at sea or the feeling you have when you’re lying in bed after having been in a swimming pool for the better part of a day. In any case it made a big impression on me. I was also a bit scared. As the quake is going on, you have no idea whether it will get stronger or if this is it. It’s very unnerving to feel the earth and the building you live in move. For Europeans at least (and definitely Belgians), the earth is a source of stability. While rivers may overflow and fires may rage, the earth pretty much remains where it is. Somehow it offers a kind of security. There is a big earthquake expected for this area (Nagoya area) in the not too distant future. The quake already has a name: the Tokai Earthquake. I hope it will not happen while we are here. This article was featured on Freshly Pressed.